The Dulins' daughter, Carrie Jane, died in a car crash on her 28th birthday, Aug. 5, 2003, en route to a new assignment in Nigeria. She had spent five years as a Peace Corps and World Vision worker in Armenia. A year after her death, the Dulins took a trip to Armenia to deliver money donated in their daughter's name to two orphanages in Sissian and Spitak. 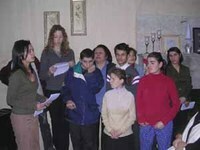 They purchased appliances for the kitchen in Spitak and an organ for the orphanage in Sissian. They also took part of Carrie's ashes and spread them at a deserted monastery near Sissian. As they left the orphanages, they asked the directors what they could do to make a difference in the lives of the children there. They were told that the children at both orphanages needed warm clothing for the winter, when they are forced to bundle up in bed and stay home from school because the buildings aren't heated. Last year, the Dulins' church, Doylestown United Methodist, organized a coat campaign and collected about 30 boxes of coats that were shipped to Armenia through the United Methodist Committee on Relief, just after Hurricane Katrina. Read more. Merrill Peterson isn't a typical Peace Corps volunteer. When, in 1997, he embarked on what he expected to be a two-year stint in Armenia, the well-known author was 79 years old. An expert on American history, particularly Thomas Jefferson and Abraham Lincoln, UVA professor emeritus of history Peterson expected to be posted to the National University of Armenia in Yerevan, the capital, where he hoped to create an American history and culture program. Seven weeks into his tour, however, illness forced his return to the US. But that wasn't the end of the story of his fascination with Armenia. "I had prepared myself on Armenia before I went," Peterson says, "particularly the 1916 Armenian genocide. When I returned, I began to do more research on the implications of genocide, and I decided I wanted to write something about it." Starving Armenians, the book that resulted from Peterson's experience, focuses on the relief efforts of a group called Near East Relief. Peterson calls the book a memoir as much as a history, since he takes the subject through the Armenian community in the US and traces their valuable contributions to American culture and society. "I wouldn't have written the book without my Peace Corps experience," Peterson says, testimony to the lasting value of the experience, despite its premature ending. Read more. Hendrix set out to not only accomplish her goals as a community development volunteer, but also to help change the perception of African-Americans in Armenia by helping to eradicate the use of the racial slur. "The challenge is getting people to see things differently and to embrace the unfamiliar, instead of the familiar. I know this will not happen overnight, but I am at least planting the seed for change in the people that I meet. I believe these experiences define my minority Peace Corps volunteer experience: educating and introducing a different aspect of American culture to the people of Armenia," she said. "I use each encounter involving the word's usage as a chance to teach Armenians about African-Americans and our history, if they are not familiar with it. It also gives me the opportunity to tell those who do not already know that the U.S. is a very ethnically diverse country with people from many different nationalities and ethnic groups that live and work there," Hendrix said of her experience of dispelling stereotypes in an ethnically-homogeneous society like Armenia. Nearly two years have passed and Hendrix's service in Armenia is almost finished. "I can honestly say that I am not the same person I was before becoming a Peace Corps volunteer. I am a better person. I am able to see all sides of an issue or situation. My views on life and people are no longer narrow — they are multifaceted and global. I am confident and self-assured in my skills and abilities, and best of all, I am a more compassionate person," Hendrix said. Serving as a minority volunteer has not been easy for Hendrix, but she has learned a great deal from the experience. "The most prominent challenge I faced upon arriving to my host country was getting the host country nationals to see me as a person instead of an object. As an African-American living in Armenia, I received a lot more attention than my fellow Caucasian Peace Corps volunteers," she said. "I find that some Armenians are still learning how to treat foreigners who look differently than them." Read more. Warm Hearth is the brainchild of a former Peace Corps volunteer, Natalie Rizzieri, who served in Armenia for two years. She and another former volunteer, Bridget Anderson, have raised nearly $100,000 to open the group home. One of the initial residents is Yulia, a 26-year-old woman whose parents abandoned her when she was 6 because she has autism. Yulia has since been shifted from orphanage to orphanage and was severely neglected until she was 15. As a result, she was profoundly underweight and did not speak for many years. Yulia is one of eight Armenians with disabilities who instead of being sent to a psychiatric hospital this year will move into the first Armenian group home with long-term care. The two hope Yulia and others like her will continue the progress they have made in recent years. Yulia now speaks and is learning to write. The project is meeting a dire need. Many countries in the former Soviet Union lack the infrastructure to adequately care for individuals with disabilities and mental illness. The Ministry of Social Welfare and the Ministry of Education & Science Secondary Education Department are supportive of Warm Hearth due to the pressing need in Armenia. Chief Specialist of the Secondary Education Department, Anahit Muradyan, emphasized the importance of projects such as Warm Hearth for the Education department as they face the challenge of what to do with orphans who reach the age of 18 but struggle with disabilities. She is optimistic about collaboration and the development of this model in the future. Read more. Read more about Peace Corps Armenia.